The Digital Visual Interface is a high-quality, uncompressed data link between a host processor video card and a display peripheral. DVI Optical technology for this transmission stretches the performance beyond the limitations of copper wire. 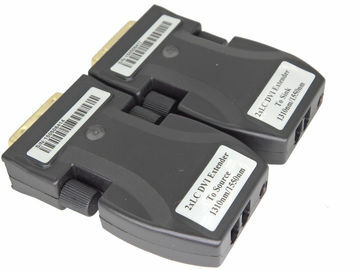 DVI Fiber Extender module consists of transmitter module and receiver module, each of which has 2XLC connectors and a 20-pins DVI–D plug. Users could decide extension length at their discretion by choosing the length of fiber-optic cables with LC ferrules at the ends. It offers graphic TMDS signals to be extensible up to the limits of modal bandwidth of selected multi-mode glass fibers, or single mode fiber. A transmitter has 4 Laser inside and a receiver has 4 Pin-PDs inside. and each transmitter or Receiver also has a WDM filter inside, which combine the 1310nm laser and 1550nm laser into one fiber. it has a capability to transmit UXGA (1600X1200) graphic signals with 60Hz refresh rate. At such data bandwidth, this module can extend up to 1,640 feet (500 meters) much over the limits of copper wire extension, without any distribution amplifier or repeater. Extends all VESA resolution up to WUXGA (1,920 X 1,200) 60Hz DVI data up to 1,500 meters (4,920 feet). Applicable to both single-mode and multi-mode fibers. Up to 500m with duplex LC multi-mode fibers. Up to 1,500m with duplex LC single-mode fibers. Offers self-EDID programming feature, detecting from a display and restoring to an EEPROM in the transmitter just by plugging to the display without any physical DDC connection. The modules are compact enough to directly plug to graphic sources and displays by adopting DVI-plugs. Certifies FCC and CE standards for EMI/RFI emission. Data security with negligible RFI/EMI emissions and loss of video quality due to no copper conductor present. FL3202M: 1-ch DVI, dual, single mode, 500Meter for MM mode or 1.5KM for single mode, MiNI type. Recommended Fiber 50/125 um Multi-mode Glass Fiber for 500m; 9/125um single-mode fiber for 1500m.